The plastic Oc® received the highest accolade of “Best Music Education Product” in the 2015 Music Teacher Awards For Excellence. Three decades of continuous development, rethinking, redesigning, retooling and remaking has brought this musical instrument to the pinnacle of its creation. It remains UK-made under the watchful eye of David and Christa Liggins, whose teaching expertise keeps the needs of both the child in the classroom, and the class teacher, in sharp focus. David and Christa’s child’s-eye-view on the playing of the instrument and their teacher’s-eye-view of methodology give a perspective that has created robust, musical instruments with ready-prepared teaching materials. The Ocarina is so simple that, with just a moderate breath, everyone is rewarded with immediate musical notes. 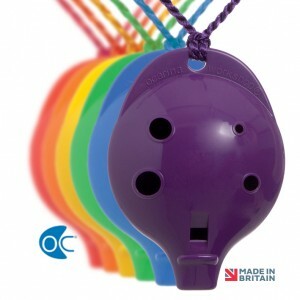 This chromatic octave range of notes can easily be explored and the different pitches enjoyed, even by children with special educational needs or physical disabilities. 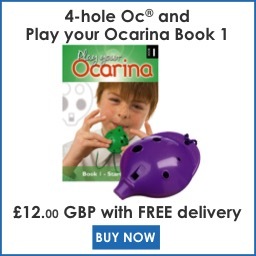 Everyone, including autistic, dyslexic and pre-reading children, can understand the ocarina notation and play tunes accurately with a good sound.